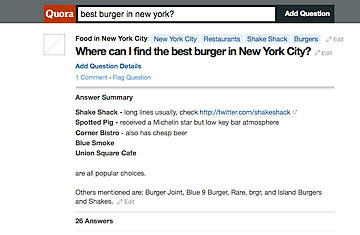 Is Quora the Next Red-Hot Web Start-Up? With websites, as with bands and restaurants, few things feel as good as discovering the next big thing before it gets big. If you were on Twitter back in 2007, for instance, you got in when the service still felt like a cool private club  long before Lady Gaga, Justin Bieber and millions of their admirers moved in. If you belonged to Facebook before mid-2004, you were used to being part of an elite class: only students at Ivy League schools and Stanford were eligible for membership. Today, there's Quora. Founded by two former Facebook bigwigs and opened to the public in June 2010, the Q&A site isn't yet a household name. But it has a feeling of hip exclusivity and impending greatness that's reminiscent of early Twitter and Facebook. Silicon Valley überblog TechCrunch is already covering the service so obsessively that the comments on its Quora posts are rife with pleas from readers begging it to take it down a notch. Like many Web 2.0 services, Quora isn't so much a new idea as a fresh take on a leftover concept from the Web 1.0 era  it's a spiritual descendant of long-forgotten 1990s start-ups such as Abuzz, AskMe and Keen. You can post questions and answers on any topic and search for ones that have already been posted, from the mundane ("When did Steve Ballmer become CEO of Microsoft?") to the metaphysical ("Why do people lie?"). As with Twitter, you can follow other members (as well as specific questions); as with Digg, everyone can vote answers up or down, so the best responses are easy to spot and the worst ones stay out of the way. Nothing extraordinary about any of that. So why is Quora attracting so much attention? It's the community. On an Internet that can feel as if it's inhabited largely by belligerent know-nothings, Quora is a place where the average citizen is an intelligent, well-informed person  and where, in a Lake Wobegonlike effect, most everybody seems to be above average. If you ask a question about a particular Web start-up, odds are that you'll get one or more thoughtful replies. And it won't be the least bit startling if one of them comes from a founder of the company in question. Even if your questions don't get good answers  some of my queries have been ignored, period  reading other users' conversations is addictive. In one example that's the stuff of legend among Quora enthusiasts, a member asked how much AOL spent to send out the zillions of trial-software CDs it distributed in the 1990s. The closest thing to an answer that person got was the less-than-definitive "over $300 million." But among the respondents were AOL founder Steve Case and Jan Brandt, the marketing executive who came up with the idea of carpet-bombing the country with sign-up discs in the first place. Both gave personal looks at a topic they know better than anyone else. You don't have to be a geek to love Quora, but it helps. For one thing, its interface is impenetrableI've been using it for months, and I still feel like a clueless newbie at times. Right now, it's saying I have 1,010 notifications, 899 items related to me, 97 items on my home page and one message in my inbox. I'm darned if I can remember the distinctions among them. For another, Quora  which is headquartered in Palo Alto, Calif., not far from Facebook headquarters  is still dominated by chatter of interest to tech-start-up types. So much of the fodder is Silicon Valleycentric that I'm startled when someone recommends a restaurant or other local business and it turns out it's not in the Bay Area. For Quora to have the lasting impact of a Twitter or Facebook, it needs to appeal to the masses. It's tough, though, to imagine the service welcoming an influx of millions of new users while retaining its cozy, smart feel. If you believe there's no such thing as a dumb question, you haven't spent much time on the big Q&A sites. The quality of the conversation at Aardvark, another such service that once seemed full of potential (and which is now part of Google) has been suffering lately. As I was writing this column, it sent me this important missive from a user: "Can someone tell me what is the time right now?" And on Ask.com  which recently announced it would de-emphasize its venerable search engine and focus on questions and answers  one of the most popular questions at the moment is "Can penguins fly?" Still, it's not unthinkable that Quora could both get big and stay good. Twitter was once just as cryptic and insidery, and it's managed to grow with surprising grace. (If you don't want to interact with the Gaga freaks and Bieberites, don't follow them, and they'll be all but invisible.) I'm sure rooting for Quora  and if you're a fan of Web services that are bursting with potential, so should you.